This review first appeared in the February 16, 1996 issue of the North County Times. 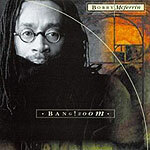 More traditional in both approach and instrumentation than many of his previous efforts, "BANG!ZOOM" is a bit of a departure for vocalist Bobby McFerrin. Known for his swooping falsetto, a cappella singing and ability to use his magnificent voice as percussion, on his latest outing McFerrin drops into his natural register and surrounds himself with top-rank musicians. If he avoids going overboard on gimmicks on this release, McFerrin doesn't get the bump in intrigue he might  mostly because of a lack of strong songs with which to show off his considerable talent. None of the originals (written by McFerrin solo or with co-producer Russell Ferrante) really takes off; none push McFerrin. It's a pleasant enough performance, but there's little to stick in your head after.